DUNKIRK, N.Y.: — Collaboration between educators in Chautauqua County and Athenex continues, with local schools actively engaged in preparations for Athenex’s workforce needs. Athenex, in partnership with Empire State Development and New York State, anticipates creating 900 new jobs in the County with its high potency oncology drug manufacturing site. Chautauqua County Executive Vince Horrigan, the Chautauqua County Education Coalition and the County of Chautauqua Industrial Development Agency (CCIDA) are coordinating efforts to align Athenex’s expected workforce needs with local training and curriculum. “We want to ensure that our Chautauqua County workforce is properly trained to take advantage of these excellent job opportunities,” said Horrigan. To continue these efforts, Kristine Morabito, CCIDA Business Development Manager, recently coordinated a tour of Athenex facilities. Educators and representatives from the Chautauqua County Education Coalition, Jamestown Community College, State University of New York at Fredonia, Erie 2-Chautauqua-Cattaragus BOCES, Dunkirk City School District, Fredonia Central School District, P-TECH, Manufacturer’s Association of the Southern Tier (MAST), Dream It Do It, Chautauqua Workforce Investment Board, and Northern Chautauqua Community Foundation Economic Development Committee participated. The visit began with QuaDPharma, a subsidiary of Athenex, located in Clarence, N.Y. The group continued to Athenex’s Buffalo, N.Y. facilities, where they saw headquarters and offices as well as new lab space currently under construction. The tour provided educators with deeper insight of Athenex’s work environment and the technical requirements of pharma manufacturing. Once Athenex breaks ground in Chautauqua County, they expect two to three years of construction, equipping, and regulatory approvals. In the meantime, they will continue partnering with the Education Coalition. “We have been incredibly impressed with the strong educational programs and welcoming business community in Chautauqua County,” noted Teresa Bair, Senior Vice President of Corporate Development and Legal Affairs at Athenex. 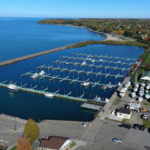 “We are moving ahead with our project and look forward to continued engagement with the Dunkirk and Chautauqua community.” Area secondary and higher education schools are closely looking at how to prepare residents with training and education to match Athenex’s needs. Collaborative efforts will continue this fall, as Athenex will soon tour several local schools and training facilities to learn more about available resources and curriculum.